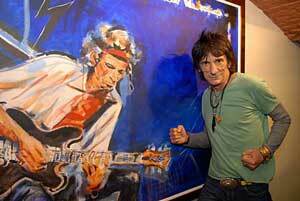 Ronnie Wood, the legendary guitarist with The Rolling Stones, is a true Renaissance man. in St. Petersburg on Saturday, the D137 Gallery is holding an exhibition of Wood’s latest work. An alumnus of Ealing Art College in London, Wood has proved himself an accomplished and prolific painter, celebrated in several exhibitions in Japan, Brazil, the U.S. and throughout Europe. Wood is foremost a portrait painter, and has had the unique opportunity to paint some of the most famous musicians of the twentieth century, including all the members of The Rolling Stones, Rod Stewart, Eric Clapton, and even Madonna. He always carries a sketch book with him on the road. The exhibit is not limited to musical themes however. Wood has included several portraits of his wife and a series of oil paintings of ballerinas. Wood launched his illustrious rock career playing with The Jeff Beck Group in the mid-sixties, before joining the Small Faces with Rod Stewart in 1969. However, Wood was always a huge fan of the Rolling Stones and claimed he always knew he would join the band one day. He recorded the hit single, “It’s Only Rock n’ Roll” with the Stones in 1974 and became an official member of the group in 1975. The Rolling Stones has been traveling for the past two years on The Bigger Bang Tour which wraps up in August.